As previously mentioned, I will be attending Salute again this year, but will be doing so on the other side of the fence, as I will be assisting Dave Stone of Wargames Terrain Workshop on his stand. So, I felt that I really should meet Dave in the flesh prior to April and therefore arranged to visit him in Gloucester last weekend. Dave was a very welcoming host, plied me with copious amounts of coffee and treated me to a very interesting insight into the creative process behind the models he creates for WTW. We also managed to get a game of Death Match in, in which my Revilli Gladiator managed to slay her Ceratid opponent, TWO of the released beasts, then got pounded into the dirt by a Horned Hominid. If you haven’t had a chance to play this game yet at a show, make sure you visit the stand at Salute, where we will be running demonstration games for most of the day. When I left, I was presented with a few items to take away with me. Some I was expecting, as these were prizes from the Death Match competitions run on The Game Cupboard last year, but Dave had very kindly added some extra items – namely a few bits that I’d enthused about when he’d shown them off on TGC. This aquatic race was designed by Tarot Hunt for the Death Match universe, and are a race of fish-like mystics, who can harness their mental power to produce a variety of effects. 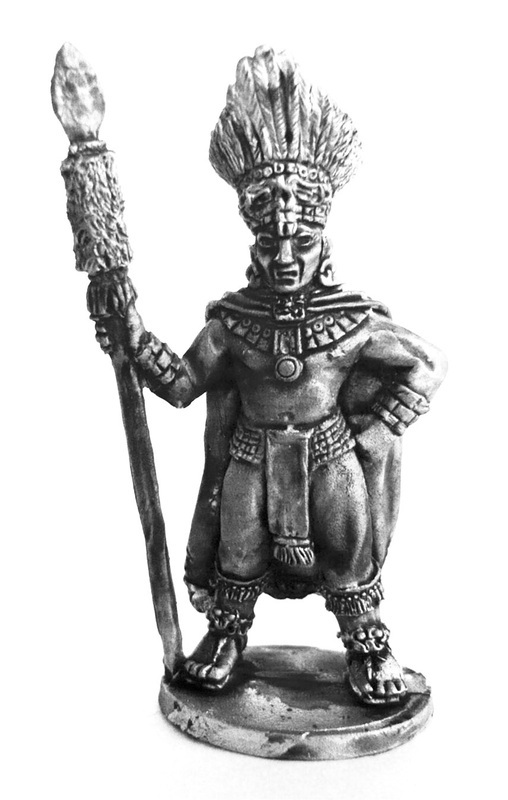 As the DM range is nominally 32mm scale for standard humanoid races, you can see that the Creminisci are roughly the same scale as a DM Human, but are larger than the 28mm figure in the picture. I asked for mine to be cast in translucent blue resin – because I’m an awkward bugger – but I believe the general release figures will be in opaque grey resin. The Nisari are a sect that believes that ‘The Games’ are an abomination and have dosed their most fanatical warriors with a potion that increases their effectiveness as warriors, but also burns them up from the inside, hence the bloodstained bandages. As you can see from the picture, the Nisari tower over a normal 28mm figure and are still pretty big in comparison to a standard DM human. But they are supposed to be, as they are Traventians, who are bigger than the humans in the game. 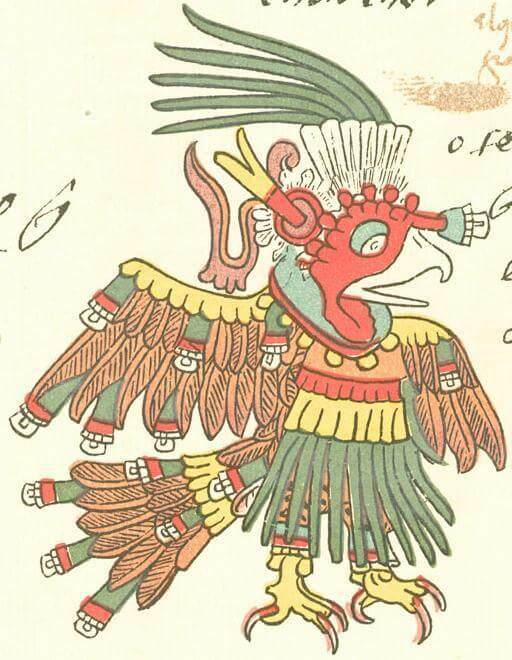 The two figures shown are the Nisari male and the Nisari Priestess, currently milking a Dust Viper for its venom. The Nisari female comes with separate arms and as I’ve not attached these yet, I decided not to show her. Now, as you may not be a Death Match player, you might be thinking why would I buy these models? The Creminisci would quite easily fit into any fantasy or sci-fi game of your choice. As for the Nisari…could you imagine Conan facing this in the wastes of Stygia? Or your Pulp Alley league being menaced by this because they opened the wrong tomb? Or maybe your Tomb Kings army needs a giant freaking insane mummy, because…well, who doesn’t? Now, these aren’t on general release yet, but I’m sure Dave will let everyone know when they will be available. The figure in the picture is one of my Victorian thugs from Ironclad Miniatures, which gives a good indication of the size of this terrain piece. Three open ‘traps’ and one currently digesting an unfortunate victim. If you play Congo, Pulp Alley or, to be frank, ANY game that ventures into the jungle, be it terrestrial or off-world, get this piece. It’s well-detailed, versatile and only £6.00. I had mentioned in my ongoing Tales of the Black Museum a previous case featuring the ‘Black Pig of Awdry Gardens’. Now, I quite fancied having a model to represent this, and mentioned to Dave that I had not yet found something suitable. He queried what sort of beast I was after and after much to-ing and fro-ing, he’d got a good idea of what I was after. Thus was born the Grice. The name is actually that of an extinct Iron Age pig that was common in Scotland, but as this beast was supposed to represent a monstrous swine, either demonic or primeval, artistic licence was employed. The Grice is now an official part of the Death Match universe, but can be used wherever you need a bloody great porker. Available now for a very reasonable £7.00. 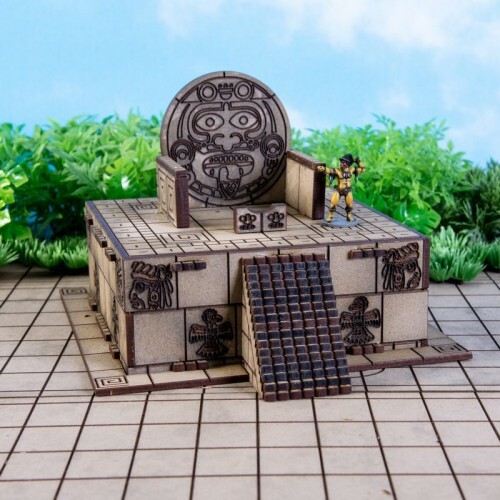 Designed for the Exuvium race in Death Match, which they use to break down the bodies of the animals they catch into a delicious and nutritious soup, this terrain piece has so many other uses. It’s reminiscent of the architecture in the Alien movies, but what the fluid bubbling away in it is, is entirely up to you and your paints to decide. As you can see from the picture, this is currently being scanned by one of my Ghostbusters, so it may contain psycho-reactive ectoplasm of ‘mood slime’. 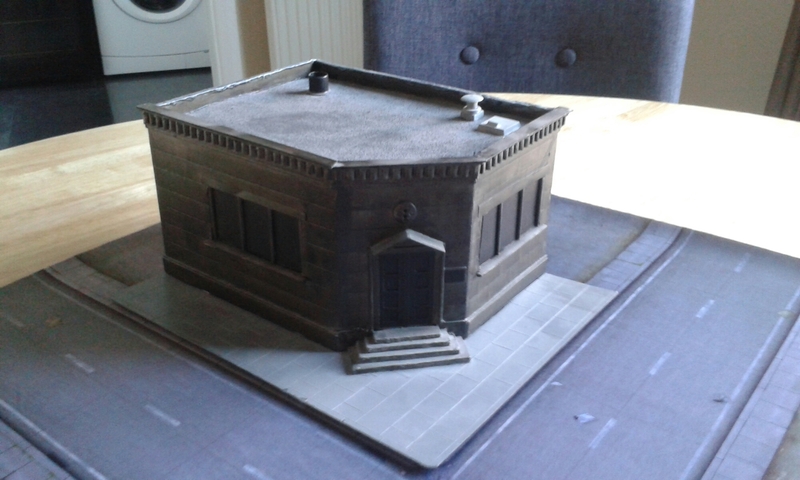 A nice solid bit of terrain for £5.00. He looks pretty pleased with it and it’s going to look awesome once painted in the appropriate livery. 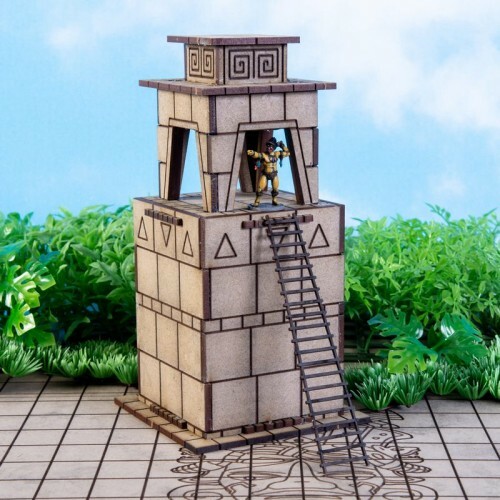 Hopefully this post has given you an idea of how these particular items scale up against standard 28mm figures and maybe added a few items to your online or Salute shopping list. Given my previous postings on my ongoing Ghostbusters Project, which started back on 4th December 2015 and ran until 27th February 2016, you may be forgiven for thinking that I’d decided to drop all things Oriental and return to it. However, this is not the case. On 15th July 2016, the ‘reboot’ of the Ghostbusters franchise was released upon the viewing public of the UK. Even though I don’t often venture to the cinema, as I find the prices extortionate, I had vowed that I would see this film. And last Friday, I did. Whilst I had been aware of the controversy surrounding the ‘reboot’, from the casting of an all-female crew of Ghostbusters to the choice of director, AND I could honestly say that the original 1984 film is my favourite film of all time, having given it some considered thought, I put myself in the box marked “cautiously optimistic”. As people who followed my posts during the Ghostbusters Project on here will know, I have very strong views on what does and doesn’t constitute “Ghostbusters”. Just because something has the official logo on it, it doesn’t necessarily mean that it IS Ghostbusters. And the reverse can also be true, as I discussed in my “Beyond Ghostbusters” series of posts, which suggested addition non-canon entries into what I dubbed the “Expanded Ghostbusters Universe”, the first of which can be read here. So, being an opinionated and self-confessed ‘expert’, IS the new movie ‘Ghostbusters’? To sum it up in a nutshell, Yes. There are several new additions to the Ghostbusting arsenal, all provided by McKinnon’s Dr. Jillian Holtzmann, and the way these are introduced and tested will remind many role-players of trips to R&D in Paranoia. The ‘ghosts’ are wonderfully realised and come in a variety of shapes and sizes (including a couple of very familiar faces), and whilst comical looking for the most part, there are a couple of pretty creepy moments. The ‘big bad’ is particularly well-done, being both cartoonish and nightmarish at the same time. So, it may not be the ‘Ghostbusters III’ that die-hard fans were clamouring for (which was actually covered off by 2009’s Ghostbusters: The Video Game, featuring a script partially written by Ackroyd and Ramis and the vocal talents of all the original cast), but is does represent the ‘Ghostbusters’ for a new generation. I thoroughly enjoyed the movie and would recommend it to anyone who enjoyed the original. As soon as it’s released on DVD, it will be joining Ghostbusters, Ghostbusters II, Freddy vs Ghostbusters and the Return of the Ghostbusters on my shelf – more details regarding these rather good fan-films can be found by clicking the links. The problem with celebrities is that you think you know them, due to having been exposed to them via television, magazines, etc. Comes across as an enthusiastic and passionate advocate of architecture and all-round nice chap, right? However, should you suggest that there might be room for another television show following the same format as Grand Designs, but concentrating on those of us in the hobby who scratch-build buildings for our games, possibly called “Grand Designs…in Miniature” and maybe hosted by everyone’s favourite Eagle Muppet lookalike, well, then you might get a different view of him. 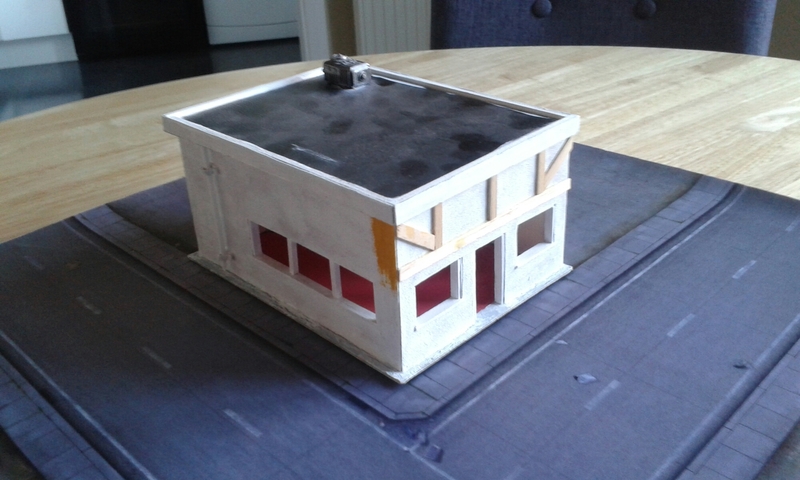 So, in the absence of my own Channel 4 television series, for the month of May I shall be concentrating on buildings for wargames, specifically scratch-built ones. And attempting to ‘complete’ some half-finished ones that have been gathering dust – literally in some cases. It’s 2′ square and has 3″ squares for the Mars Attack game, but these are so faint that they can be ignored. 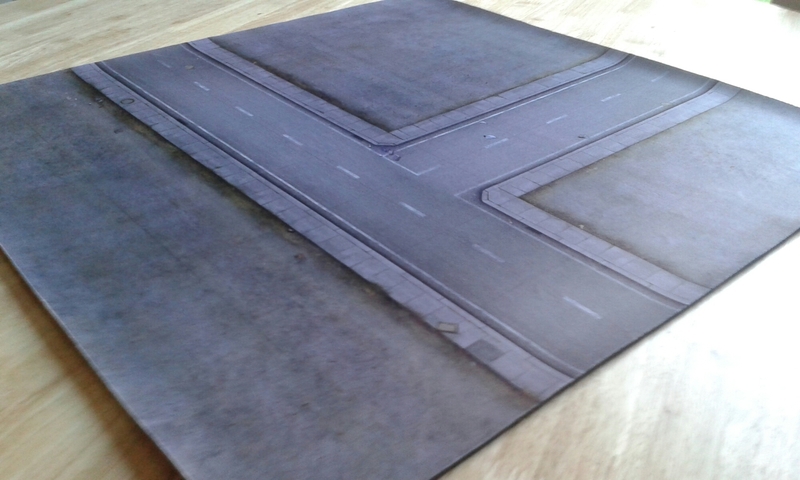 It’s a thin pre-printed cloth mat with rubber backing – so essentially a giant mouse mat. The detailing is very nice, although the roads are a little narrow for 1/43 scale vehicles, but if you’re primarily using it for skirmish gaming, this isn’t an issue. And for what you get, it’s very reasonable. I think I only paid half retail including shipping, which was a bargain. However, I personally have two issues with it, 1. It would appear Mantic no longer sell it and 2. as my primary playing are has change from a 3′ x 4 1/2′ oblong table to a circular 3′-ish table, it’s no longer really suitable except for very small games. 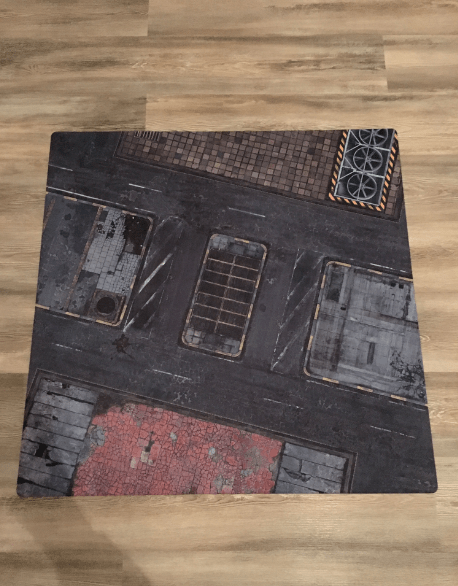 This is the Urban District 3′ x 3′ gaming mat from Urbanmatz. This will set me back 35 Euros, but is a rubber-backed cloth-topped gaming mat, similar to my Mars Attacks one, and comes with its own carrying bag. And the image above is of the 3′ square one – they do bigger sizes for those with greater table space. 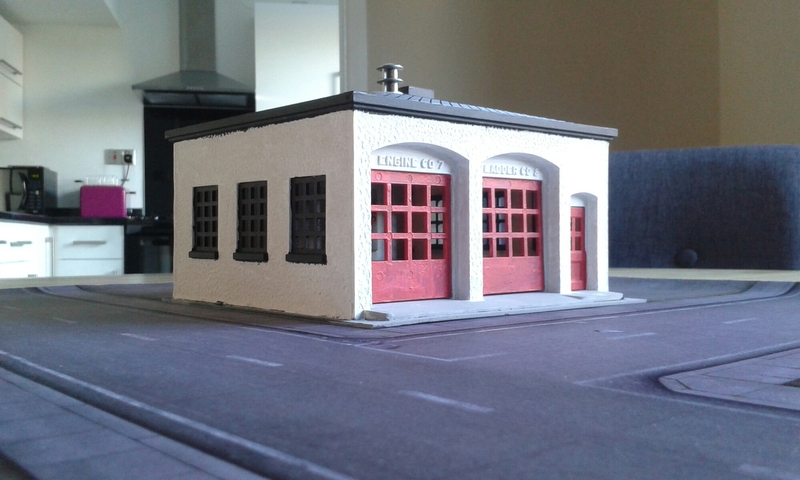 Follow the link above to see a gallery of the may being used for the Batman Miniature Games, which was one of the reasons I decided on it. This is my kura, from Oriental Fantasy month back in August last year. 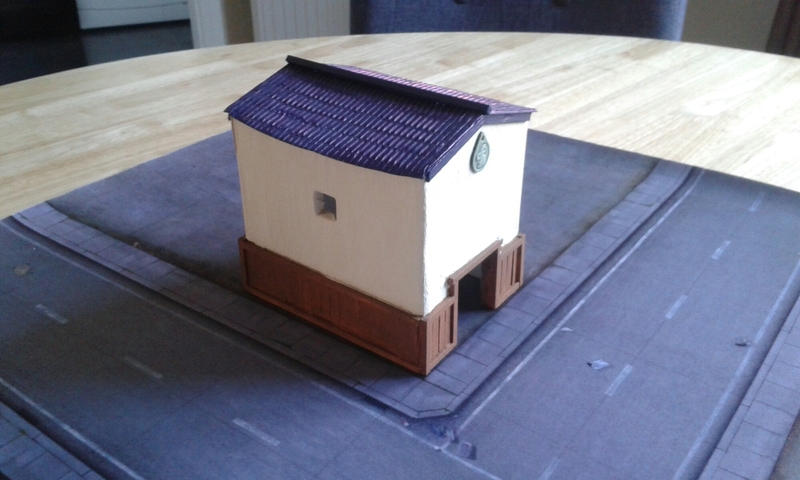 As I ran out of time, I failed to provide a scenic base and door, which means that as storehouses go, it’s not particularly secure. So, that’s the first building. Whilst I know this isn’t strictly scratch-built, it has been modified and still needs finishing, so it’s been added to the list. One of the first buildings I ever made, it’s a sealed unit on its own base. Lsts of nice fancy detailing, but I made the mistake of painting it a very dark brown and it needs a face-lift. Due to parental responsibilities this week, I haven’t had any ‘hobby-time’. However, as last week was very productive, I do have some ‘banked’ figures, which I decided not to post last week, as my last post was rather lengthy. Having thought myself rather cunning, I have finished off some Nurglings to use as ‘ghosts’, only to find that great minds think alike and Simon over on Fantorical had also posted some painted Nurglings! However, Simon’s appear to be the one-piece plastic ‘stack’ of Nurglings, whereas mine are the individual metal miniatures, from when they were first released. We have, from left to right, the DC Heroclix Orange Lantern Construct, DC Heroclix Fire, Marvel Heroclix Living Lightning and the Ral Partha zombie. Yay, more transparent ghosts! The reason I say they’re ‘almost’ finished, is that when I was dry-brushing them I noticed that I’d failed to repaint the figure on the far left’s left hand – it was still green! So I had to repaint it red and have yet to finish the dry-brushing on this. 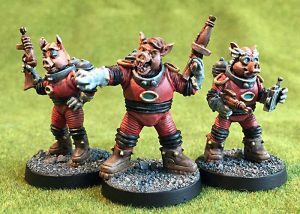 A relative straightforward paint job on these – bodies were undercoated in GW Red Gore, with the ‘guns’ being painted with Docrafts Linen. The figures were then dry-brushed in their entirety with the same colour, giving that exposed bone look. The guns were then washed in GW Spearstaff Brown, which makes them look slightly pink and bony-looking. The globes on the guns were then painted with GW Mithril Silver, followed by a coat of GW Purple Ink, which was also used to colour the eyes. The Soul Hound (a Grenadier Hound of Tindalos, now re-named as a Bloodsniffer of Chaos by Mirliton), received the same treatment, but his tongue was given a thin coat of GW Imperial Purple, which is actually a dark pink. Join me back here next week, where I will hopefully have finished my Ghostbusters, as the number of ghosts seems to be increasing in both size and number.